Happy Friday!! (I know it’s Saturday now, but when I wrote this last night, I still had to wait for the project to dry before I could take the “after” picture. Pretend you’ve gone back in time.) Today was a good day. I hope yours was good, too! When I came home from work, J and I had edamame nuggets for dinner (or as we fondly call them, nugs) which were delicious. And then I got to craftin’! Background: In high school, one of my really good friends worked at a CVS. She stole this sweet lab coat for me (that’s what friends are for, right?) and I’ve kept it all these years. 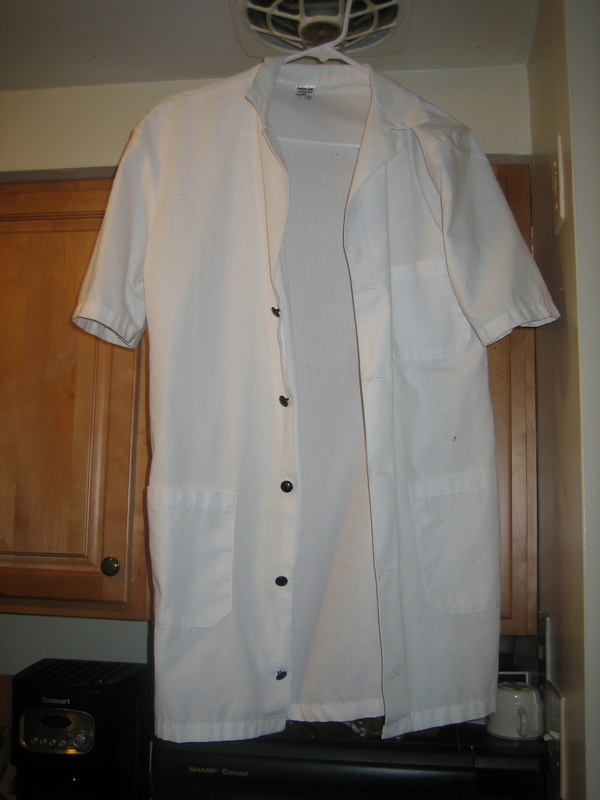 It’s undergone some changes, like the addition of black buttons in place of white, or the insertion of some seams on each side to make it less boxy and more fitting, but in the end, it’s always been a big white lab coat. And I loved that. But today, I decided to take things up a notch. 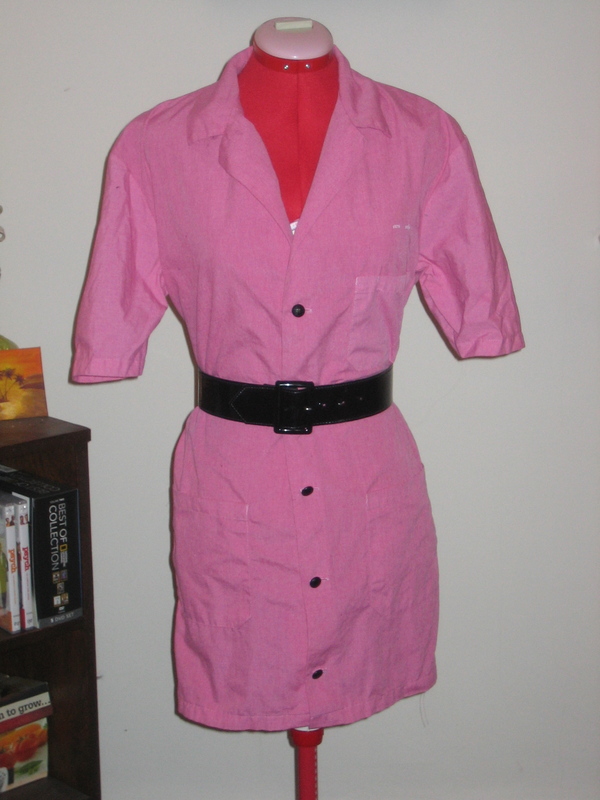 Today, my basic lab coat went from lab-drab-white to rethink-it-pink! Because I’ve dyed things before, I figured you didn’t need a step-by-step guide. Instead, here’s a before and after picture, along with six helpful tips that never seem to be mentioned when people write tutorials on dying fabric. Note: all of these lessons were learned the hard way. Enjoy! Bring it, lab coat. Let’s do this. 1. Roll up your sleeves, don’t just push them up. Pushing them up works for about half a second, or right until your gloved hands are fully emerged in the boiling dye-water. 2. Take off your rings before you put your hands in your rubber gloves and stick them in the steaming dye-water. Your hands WILL swell, and your rings WILL get stuck and you WILL feel like you have sausage fingers. 3. Find a good hour-long episode of something fun to watch on Netflix. (Did I mention Crossing Jordan just got added to Instant View?) The reasons are two-fold. One, it entertains. Two, it also works as a timer. When the episode ends, your fabric is done. 4. Wear something comfy, but also form-fitting. Comfy is important because as soon as your hands are in the dye, you can’t just pull them out and scratch your leg where the tag of your pants keeps itching. “So I’ll wear baggy pants,” you say naively. Wrong. Baggy clothes will always catch the edge of the bucket/pail/whatever you’re dying in, and yank it halfway across the kitchen floor, flinging purple water everywhere. Every time. 5. If you buy your bucket/pail/whatever at the dollar store, prepare for it to crack the second time you use it. If you’re lucky, it will crack horizontally, across the top and will still be useable. For now, at least. 6. Go ahead and take two years off of your life expectancy. I don’t have any scientific proof, but I can’t believe that breathing in the steam rolling off the top of a bucket full of chemicals for an hour can be good for you. Who knows though. Maybe you’ll live forever. So, what do you think? Am I lab-chic or what? 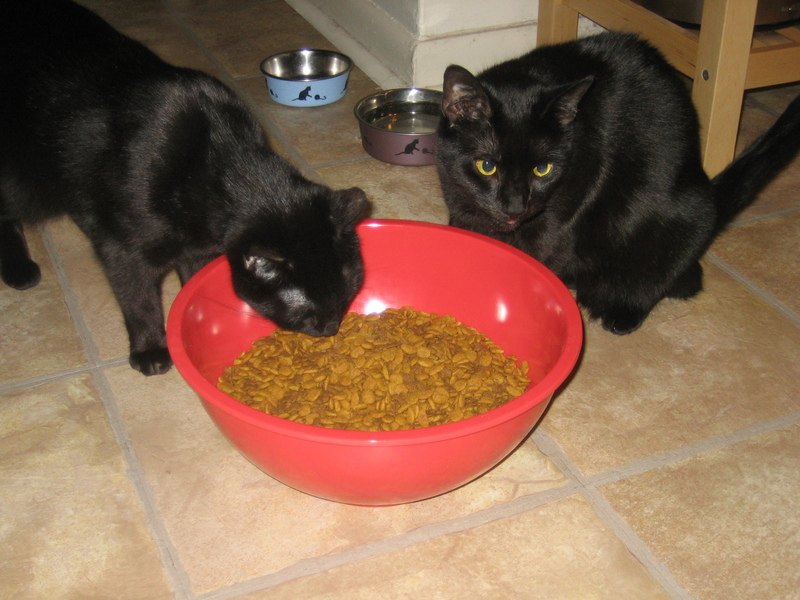 Bonus picture: The kitties eating dinner out of a mixing bowl like it’s no big thing.